Forcefield is recommended by the friends of the Parent’s Summit, Dr. Josh and Christi! An online safety tool for phones – both Android and iPhone – Forcefield includes all the tools a parents looking for: app timers, geo-location (knowing where you child’s phone is), website white and black-listing and more. While many of these features are working their way into phones natively (there are many tools on iOS 12 and Google’s Family Link), many families are still looking for tools to help manage their children’s online use. 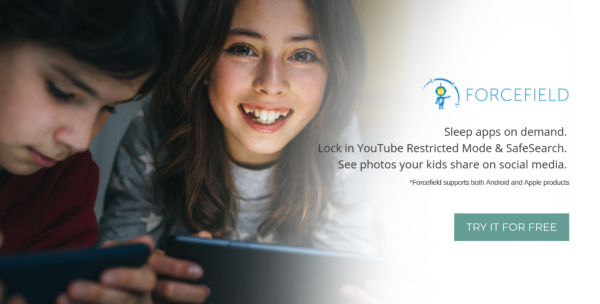 Forcefield protects all the devices your child uses. It’s not necessarily cheap, at $11.99 a month or $94.99 a year. Additional children are added for at a lower pricepoint. Forcefield does offer a unique ‘concierge installation’ where they individually help you install the app on your children’s devices. For less tech-inclined parents, this is a nice option. It’s hard to disagree with that! Notably, the Android app reviews share very little information about the effectiveness of the tool. They’re a discussion about the validity of installing internet blocking apps. You’ll find many 1-Star reviews from “13 year old’s who know what they’re supposed to do.” Perhaps that’s reason enough to give it a try. Forcefield does off a 30-day free trial. Well, it’s not for 13 year old’s who think their privacy is paramount. Or, perhaps it is! Tech conscious parents should give it a try.